US secretary of state Condoleezza Rice today said Pakistan President Gen Pervez Musharraf should “take off his uniform”, as Washington suspended annual defence talks with Islamabad because of the political situation there after the imposition of Emergency. Amid uncertainty over the fate of the January polls in Pakistan, President Pervez Musharraf has said holding the general elections in a free and fair manner and on schedule was his top priority. Deposed Chief Justice of Pakistan Justice Iftikhar Muhammad Chaudhry has vowed to launch another phase of his struggle to uphold the Constitution, the rule of law and independence of judiciary. Pakistan President today administered oath to four judges of Federal Shariat Court under the Provisional Constitutional Order (PCO) here at Awan-e-Sadr. The Netherlands has suspended aid to Pakistan after PresidentMusharraf imposed emergency rule, Dutch Development Aid Minister Bert Koenders said today. The Pakistan government has freed 25 militants, including some convicted by anti-terror courts, in exchange for 211 soldiers who were being held hostage by rebels in the restive northwestern tribal areas. Former Pakistan prime minister Benazir Bhutto today asked President Pervez Musharraf to lift the emergency, revive the Constitution and hold elections under an “independent caretaker government”. Pakistan President Gen Pervez Musharraf proclaimed emergency in the country only after receiving a nod from the Bush Administration, a diplomatic source has claimed. Though the USA was averse to the idea of imposing emergency, it gave the go ahead to Musharraf because of the sporadic violence across the country, especially in the troubled Swat region and other tribal dominant areas, the source further revealed. Amid US apprehensions on China’s military modernisation, the two countries today agreed to establish a defence hotline and deepen military-to-military dialogue, including on nuclear policy strategy and doctrine. Seven Tamil Tigers and a soldier were killed in fresh fighting in northern Sri Lanka, the military said today, hours before the funeral of the rebels' political wing chief. Clashes between the two sides continue unabated in the north of the country. The Indian Ocean island remains on a high security alert after S P Thamilselvan was killed in a bombing raid by the Sri Lankan air force on Friday. The Fijian police today charged three suspects and rounded up others over an alleged plot to assassinate coup leader Voreqe Bainimarama and other political and military leaders. 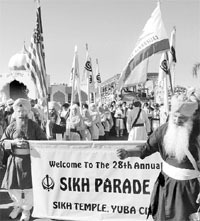 In a unique display of religious solidarity, nearly 100,000 Sikhs, cutting across all barriers of caste and political affiliation, yesterday participated in the 28th Sikh Parade, an annual feature in this American city for over a quarter-century. The Bangladesh High Court has granted bail to former prime minister Sheikh Hasina in a graft case filed by the powerful Anti-Corruption Commission (ACC) though the Awami League chief would remain in detention to face charges in several other cases. The DNA and viscera of the body, suspected to be that of abducted Indian journalist Birendra Kumar Sah, has been sent to Hyderabad for identification. US President hopeful Hillary Clinton continues to lead her rivals by a substantial margin among the Democrats but finds herself trailing behind Barack Obama and John Edwards among the independent voters, shows a new poll released a year before the election. US secretary of state Condoleezza Rice met Palestinian leaders today to prepare for a Middle East conference after vowing to defend Israel’s security but urging bold efforts to make peace. Several people were being probed after Australian Customs seized a parcel from India containing about 1 kg of pseudoephedrine priced around $1.5 million hidden in a package of tablets at the Sydney Mail Centre. A day after she said the US would “review” its financial aid to Pakistan, Rice mounted pressure on Musharraf making a direct call that the General quit as army chief and restore civilian rule. At a news conference in Ramallah, Rice urged Musharraf to follow through on past promises to “take off his uniform.” “I want to be very clear. We believe that the best path for Pakistan is to quickly return to a constitutional path and then to hold elections,” she said. Defence secretary Robert Gates, acting in tandem, said in Bejing that the US was reviewing all its assistance programmes to Islamabad and urged Musharraf to restore democratic rule. Rice said yesterday that the USA would review aid to Pakistan but indicated it would not suspend aid wholesale. She had also said “the USA did not put all its chips on Musharraf.” The USA has provided about $11 billion to Pakistan since 2001 for the war against terror after the September 11 terror attacks. Meanwhile, Eric Edelman, undersecretary of defence for policy, who was supposed to head a US delegation to the two-day talks scheduled to open at Islamabad tomorrow, will not go until political conditions improved in the country, Pentagon spokesman Geoff Morrell said in Beijing. “These(Defence talks (are important bilateral meetings that require an atmosphere in which all the issues can be discussed with the full attention of all participants,” Morrell said in Beijing. Morrel is accompanying defence secretary Robert Gates, who today called for Pakistan President Pervez Musharraf to return his country to a constitutional democracy. “We urge President Musharraf to return his country to a law-based, constitutional and democratic rule as soon as possible,” Gates told reporters in Beijing. Gates described the developments as “disturbing”. But he emphasised that any US action against Pakistan should have no impact on global efforts to fight terrorism. “We are reviewing all our assistance programmes (to Pakistan), although we are mindful not to do anything that would undermine counter-terrorism efforts,” said Gates, after a meeting with Chinese Defence Minister Cao Gangchuan. “Some of the aid that goes to Pakistan is directly related to the counterterrorism mission,” Rice told reporters yesterday. “We just have to review the situation. But I would be very surprised if anyone wants the President to set aside or ignore” the responsibility to national security that can come through such cooperation, she said. Rice said she had not spoken directly with Musharraf since he announced what she called “extra-constitutional” moves on Saturday. Attorney-General Malik Abdul Qayyum said Pakistan’s National and provincial assemblies will be dissolved in 10 days’ time. ‘’It has been decided there would be no delay in the election and by November 15, these assemblies will be dissolved and the election will be held within the next 60 days,’’ Qayyum told Reuters. Pakistan’s western allies have sought reassurances that polls would go ahead as expected in January after President Pervez Musharraf suspended the constitution and imposed emergency rule on Saturday. Musharraf cited spiralling militancy and hostile judges to justify Saturday’s action, and slapped reporting curbs on the media in a bid to stop outrage spilling onto the streets amid Pakistan’s biggest crisis since he took power in a 1999 coup. Prime Minister Shaukat Aziz said outstanding cases lying with the Supreme Court, including challenges to Musharraf’s re-election by parliament last month while still army chief, need to be concluded. ‘’We don’t want to disrupt the election process. We want a free election,’’ Aziz said. The election is supposed to mark a transition to civilian-led democracy, and Musharraf, who took power in a coup eight years ago, vowed last month to quit the army and become a civilian president if he was given a second term. Many Pakistanis believe Musharraf’s main motive in declaring emergency rule was to pre-empt the possibility of the Supreme Court invalidating the general’s election victory on October. 6. Meanwhile, Musharraf said on Monday he was determined to quit as army chief and become a civilian president, amid mounting pressure from the United States to end emergency rule and return to democracy. “I am determined to execute this third stage of transition fully and I’m determined to remove my uniform once we correct these pillars in judiciary and the executive and the parliament,” he told foreign diplomats in comments broadcast on state-run Pakistan Television. Earlier, Musharraf said holding the general elections in a free and fair manner and on schedule was his top priority. Musharraf made the assurance at a meeting with the ruling alliance, including the leaders of Pakistan Muslim League-Q, where it was resolved that the state of emergency would not be prolonged, daily 'The News' reported today. The President, in his first interaction with the leaders of the ruling alliance after the imposition of emergency, made it clear that the holding of the general elections in a free and fair manner according to the previous schedule would be his top priority, it said quoting highly-placed sources. However, the ruling alliance is divided on the question and it is expected that the ultimate decision in this regard would be taken in a week. One group of the alliance is asking for extending the tenure of the present assemblies by at least six months, while the other group is of the view that the general elections must be held without any delay. The government arranged the briefing as it was “keen to address the concerns of foreign governments” regarding the constitution being kept in abeyance due to the emergency. Foreign office spokesman Mohammad Sadiq said Khan briefed all 87 ambassadors and high commissioners in Pakistan about the latest political developments, the Daily Times said. Sadiq said the envoys were briefed about the causes that led Musharraf to declare the emergency. The Chief Justice, who was the prime victim of Saturday’s provisional constitutional order (PCO), is confident that he would stage a comeback and reiterated that the present setup is illegal and all superior judiciary’s latest appointments have no validity. Iftikhar, who is under house arrest, told The News on telephone late on Sunday night that the seven-member bench of the apex court headed by him had stayed the PCO and also restrained the judges of the superior judiciary from taking oath under the PCO. This ruling had rendered the newly installed judicial structure completely illegal. Justice Chaudhry said the judges appointed in all provincial High Courts and the Supreme Court on Saturday and Sunday had no legal backing. “Everything that is happening today is illegal, unconstitutional and against the orders of the Supreme Court,” Justice Iftikhar said, adding that he was sure that the pre-November 3 situation would revive. Sounding confident and relaxed, while making his first public comment on the emergency, Justice Chaudhry said he had neither done anything wrong previously when he was suspended on March 9, nor had he done any such thing now. “God has blessed me with success last time and I am sure that he would again bless me and other respected judges, who had refused to take fresh oath under the PCO, in a similar manner this time too,” Justice Iftikhar said. Chief Justice of Federal Shariat Court Justice Hazik al Khairi, Justice Fida Muhammad Khan, Justice Salahuddin Mirza and Justice Zafar Yasin took the oath, Asoociated Press of Pakistan reported. "This is a dramatic coup d'etat that we strongly disapprove of and that undermines Pakistan's democracy, development and population," Koenders said. Military spokesperson Maj- Gen Waheed Arshad said 211 soldiers had been released and 25 militants, who were arrested under the Frontier Crimes Regulation, were freed yesterday in South Waziristan in the Federally Administered Tribal Areas. Some of the freed militants, which include 24-year-old Sohail Zeb, a relative of slain Taliban commander Abdullah Mehsud, were convicted by an anti-terrorism court, media reports said. A total of 247 army personnel, including eight officers, were captured by the men of Taliban commander Baitullah Mehsud on August 30. Thirtyone soldiers were released subsequently while three were killed by the militants to pressure the government to accept their demands. The release of the soldiers yesterday was facilitated by talks held with the militants through a jirga or council of tribal elders. The militants brought the 211 soldiers to Tiarza Khula, a remote area in South Waziristan, and handed them over to the tribal elders. The military brought the 25 militants in two helicopters to the brigade headquarters near Wana and they were later taken to Tiarza Khula for the swap. 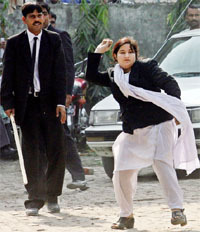 Reminding Musharraf of his commitments, both public and private, to confidence building measures that would move Pakistan towards the transition to democracy, she said he (Musharraf) has imposed martial law at a time when he should be demonstrating to the country and the world his seriousness in allowing free and fair elections. Stating that rise of extremism and militancy could not happen without support from elements within the administration, Bhutto asked Musharraf to revive the Constitution by lifting emergency. “This can only be seen as a step to entrench his dictatorship,” the Pakistan People’s Party (PPP) president wrote in a commentary for CNN. The Bush administration believed that the emergency was necessary to contain rising extremism in the country, The Nation reported. Another source said if that were not the case, the Pentagon would not have rushed to announce that the USA would continue its military aid to Musharraf regime. “At this point, the declaration does not impact on our military support for Pakistan’s efforts in the war on terror,” said Geoff Morrell, the Pentagon press secretary. Reflecting the improved security ties, US defence secretary Robert Gates and Chinese defence minister Cao Gangchuan announced after their talks the setting up of the hotline linking their defence departments, the first of its kind Beijing has ever established with any country. Besides the hotline to “reduce the risk of misunderstanding”, they agreed to enhance military exchanges at all levels, Gates said in his remarks noting that Washington’s relationship with Beijing had been “candid, constructive and cooperative”. “We discussed the need to move forward and deepen our military-to-military dialogue, including that on nuclear policy strategy and doctrine,” Gates said. During the meeting, Gates raised the US concern over China’s military modernisation and urged greater transparency to “allay international concerns”. Relations between the USA and China have been warming up since 2001 after it soured when an American spy plane collided with a Chinese fighter jet but Washington has been repeatedly expressing concerns over the military expansion by China, whose defence budget shot up by 17.8 per cent this year. The latest fighting was reported from the northern districts of Vavuniya and Jaffna, a military spokesman said. "Troops attacked a group of terrorists who tried to attack the forward defence line in Nagarkovil in Jaffna and killed four terrorists," spokesman Brigadier Udaya Nanayakkara said. Three rebels and a soldier were killed in an earlier confrontation yesterday in Vavuniya, the military said. Analysts say the killing of Thamilselvan had hurt the chances of the conflict ending soon. Thamilselvan, who led the rebel delegation at the last round of peace talks with the government in late 2006, was the most senior Tamil Tiger leader to be killed by troops in years. Sri Lankan authorities expect the rebels to retaliate and have stepped up security in the capital Colombo, erecting new road blocks, deploying extra patrols and asking people to be vigilant about any suspicious activity. The number of arrests since Saturday rose to 16 as the Australian and New Zealand governments angrily denied the hints by the Fijian police chief of being linked to the alleged plot. Fiji's police commissioner Esala Teleni said the police had laid charges of treason, incitement to mutiny and conspiracy to murder against the three. He did not identify the three, who are due to appear in court tomorrow. A decision on whether to charge the other 13 arrested was due to be made within two days, he added today. “The police investigation had successfully blocked any threat to the government, the community, the safety and well-being of tourists in this country," said Teleni, who was formerly Bainimarama's second-in-charge in the military. Teleni yesterday accused non-governmental organisations funded by the governments of the neighbouring countries of the involvement in the plot. The 4.5-mile long procession, which featured floats depicting Punjab’s rich cultural heritage, brought all activity on the Butte House Road, Civic Centre Boulevard, Poole Boulevard, and Tharp Road, to a halt. The participants came from all parts of the USA, United Kingdom, Canada, Germany and India. Led by the Panj Pyaras, the parade, held to commemorate the installation of Guru Granth Sahib, started at 11 am with the holy scripture being placed on a flower-decked vehicle followed by ‘ardas’ and a shower of rose petals from a helicopter. Although preparations for D-day began almost a month back with a series of ‘Akhand Paths’ at the Tierra Buena Gurdwara, where multi-millionaire Didar Singh Bains is the president, the event reached its climax yesterday with surging crowds packing the city streets for over five hours. Religious fervour touched its peak with wafts of Gurbani drifting in the air even as volunteers from places like Los Angeles, Reno, Sacramento, Fresno and Tracey got busy at countless stalls all over, serving food to the needy. Top ‘raagis’ from the Golden Temple, including Bhai Nirmal Singh, Bhai Sarabjit Singh, Bhai Devinder Singh, and Bhai Sukhwinder Singh led the Gurbani recital assisted by Bhai Onkar Singh and Bhai Amarjit Singh Taan. As the sea of humanity meandered through the streets in the backdrop of the Sutter Buttes, the world’s smallest mountain range, enthusiastic youngsters overcome with emotion rent the air with cries of ‘Jo Bole So Nihal.’ Many of them, born and brought up here, viewed the parade as a window to the land of their forefathers. As Ejaypaul Dehal, a senior executive at a local fruit processing unit said, the parade provided a glimpse of their heritage which they held so dear. In sharp contrast to Halloween, a low key affair four days back, the Sikh parade had sparks of boisterousness, generating curiosity among Americans. Many of them evinced keen interest in the function. According to Jagroop Singh, an ex-serviceman from the Corps of Signals, the first parade held in 1980 was more or less an effort to showcase the Sikh identity. Among those who joined the parade yesterday was Republican Congressman Wally Herger. A High Court bench of judges Shah Abu Nayeem Mominur Rahman and Zubayer Rahman Chowdhury granted bail to Hasina and stayed the proceedings under the Emergency Powers Rules (EPR) filed by the ACC charging her with taking Taka three crore in kickback in a power plant deal. On a writ by Hasina, the court yesterday ordered the ACC to explain in eight weeks why she should be tried under the EPR, but allowed the authorities to continue the investigation in the case. It asked the government to explain why the case under the ambit of the EPR should not be declared illegal. Sah’s body was found in the jungle of Amlekhagunj of Bara near Indo-Nepal border on October 13. His family, however, failed to identify the body, which was in an advanced stage of decomposition. Clinton's support tops out at 49 per cent in trial heats against the Republican’s Rudy Giuliani, Fred Thompson and Mitt Romney. Her four-point margin (49 per cent to 45 per cent) over Thompson and Romney is significantly less than Edwards's and Obama's performance. Obama and Edwards lead Romney by 53 per cent to 37 per cent. Edwards leads Thompson by 53 per cent to 39 per cent and Obama leads him by 52 per cent to 39 per cent. The poll, conducted for Newsweek by Princeton Survey Research Associates International from October 31 to November 1, finds that Clinton gets 44 per cent votes of the overall Democratic vote, compared to 24 per cent for Obama and 12 per cent for Edwards. On her eighth visit to Israel and the Palestinian territories this year in a bid to advance efforts to revive full peace talks after seven years of stalemate, Rice spent the morning locked in top-level talks in Ramallah. She first met Ahmed Qorei, who heads the Palestinian negotiating team that is battling to draft a joint document with Israel to serve as a basis for the US-sponsor conference later this year. “We spoke about the need (for Israel) to apply a series of measures on the ground showing people that the negotiations are serious, such as removing checkpoints, releasing prisoners and a halt to settlement,” Qorei said. Rice also met Prime Minister Salam Fayyad and President Mahmud Abbas separately at the Palestinian leadership compound in Ramallah, political capital of the occupied West Bank. “The drugs were concealed within professional packaging which indicates a sophisticated attempt to beat border controls,” Customs’ national director of enforcement and investigations Brian Hurrell said. The drug, in tablet form, was stored in 47 bottles labelled “Himalaya pure herbs”, he said.